Summary: Move over, Clapper -- there's a new on-off switch in town! Station: KDKA Channel 2 Reporter: Yvonne Zanos When It Aired: April 24 Running Time: 4 minutes, 8 seconds Visuals: * Our female co-tester settling down on her sofa with a book, knowing that soon, darkness will fall, and the inevitable will happen: She will have to stand up, reach over, or worse yet -- perhaps even walk across the room -- to turn on a lamp. 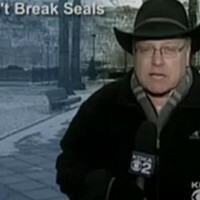 Highlights: * When anchor Ken Rice bloviates, "The best reporters take nothing at face value. Following rule number one of journalism: If your mother tells you she loves you, check it out. That's the kind of good, old-fashioned, hard-boiled skepticism that consumer editor Yvonne Zanos brings to every installment of 'Does it Really Do That?'" * When Zanos responds, "Whoa. What an introduction! And that's right: Here at KDKA we want to find out for ourselves. 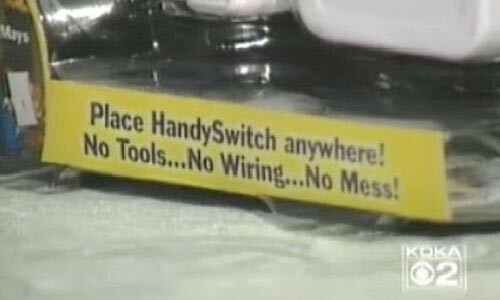 So, what about the HandySwitch? It claims to be a product for people who are tired of getting up to turn off the lights. It sells for $19.99; it's a wireless remote for your lamps. "* A scene from the product's infomercial: "HI! BILLY MAYS HERE FOR THE HANDYSWITCH! THE NEW WIRELESS LIGHT SWITCH THAT LETS YOU CONTROL ANY LAMP FROM ANYWHERE!" * When Zanos reveals, "The hardest part is trying to remove the product from its plastic packaging." * When Zanos, her co-tester and her 13-year-old son simultaneously "ooooooh" after the switch works. * When Zanos reminds us not to get too excited, yet: "But that's just a few feet away. ... This product is supposed to work from the outside, too -- up to 60 feet away. So we go out in the front yard." After the HandySwitch does its magic again, they all scream in unison, "It worked!" * When Zanos really pushes the envelope: "And finally, we take the HandySwitch to its limit, two houses away." * When Zanos reports, "The lamp does not come on. And what about that promise that you can drive home with the HandySwitch in your car and turn on the lights in your dark home? The first time we tried it, it didn't work, but the second time, it did." * When Zanos concludes: "[W]e do give HandySwitch a definite thumbs-up." What We Learned: If necessity is the mother of invention, laziness must be its evil cousin. Unanswered Question: What -- there's no device to give a "thumbs-up" for you? News Value: 4. Now that's what I call living on the edge, Yvonne!